Joanna here, with Jeannie Lin, author of Butterfly Swords, (Harlequin Historical, 0373296142, buy it here,) winner of RWA's 2009 Gold Heart Award. Lin was also a break-out favorite in my personal 'exciting heroines I wish I could write,' category. I like me some strong heroine and I like me exotic locales and strong, protective heroes. That was Butterfly Swords. I'm expecting the same three-for-three in The Dragon and the Pearl. On to the promised interview . . .
Me: What sort of books influenced you when you were a growing up? Jeannie: I was highly influenced by adventure stories: King Arthur's tales, Greek myths, fantasy adventures (former D&D geek here), and martial arts movies. I always had a thing for larger than life heroes and heroines and ultra-dramatic scenarios (we might even say melodrama). Me: I also love me some ultra dramatic. Nobody's going to be surprised to hear that. What draws you to this period in history? With me and the Napoleonic era, it's the clothes. *g* You? Jeannie: Oh, I do have to admit the clothes were a part. I used to watch these gorgeous Tang Dynasty costume dramas (think Curse of the Golden Flower with Chow Yun Fat for a more recent reference). They featured Empress Wu and her irrepressible daughter Princess Taiping. It was an elegant, glorious, treacherous and bloody time and these little clever women emerged as the biggest badasses of them all in a court full of powerful men. I loved it. Me: What do you consider the Historical Romance canon? Jeannie: Actually I feel super unqualified to answer this as I'm not well read in the canon and feel I must catch up! The historical romance police will take away my card when they learn I've only read Laura Kinsale's Flowers from the Storm and Judith Ivory's Beast this year. Woodiwiss' The Flame and the Flower is on my TBR. Similarly The Rake by Mary Jo Putney is also TBR'ed. Every time I read one of these "canon" books I'm blown away and think people who look down on historical romance "back then" weren't reading the right books. Can I lump Gone with the Wind in there? (I have read that one!) My foundation was Johanna Lindsey, Amanda Quick, Julia Quinn and Lisa Kleypas. I'd really love recommendations on this front. Me: I like your choices of canon, and agree with them. My own favs, in fact. Let's talk about The Dragon and the Pearl. 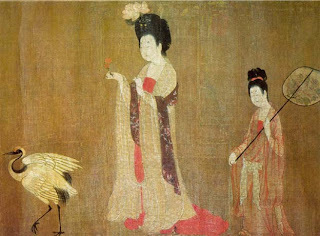 How is your new heroine, Ling Suyin, alike, and different from, Ai Li, the heroine of Butterfly Swords? Jeannie: Both of the women are empowered, but I think of Ling Suyin as experienced in wielding her power whereas Ai Li was learning and earning her independence. Because of this, Ai Li was more willing to take risks and make mistakes whereas Suyin is more strategic and cautious. Ai Li was so darn nice! I know everyone thought she was all kickass and such, but at her heart she was a really good girl and always trying to do the right thing. The swords fooled everyone--even as a swordswoman she practiced all the time. Ling Suyin is not as honorable. She's a survivor. Me: Random questions here. What was the hardest scene to cut from Dragon? Jeannie: This is a thought-provoking question. Almost two-thirds of the book remained completely intact through all edits whereas the ending was tweaked quite a bit. There was an assassination attempt on Suyin's life where she was saved by a secondary character, the cripple named Jun. In the end, it wasn't needed for the central story, but I so loved the nod to so many martial arts elements in the scene (remember Jeannie, you're writing a romance...not a kung-fu flick). Me: I admire your strength. I hate to cut good scenes. I just hope you'll post it on your blog as an out take some day. More random question. Did your characters have any surprises for you while you were writing? Anything you didn't foresee? Jeannie: Oh...how do I do this without spoilers? I knew Li Tao and Suyin before the story started because they had been featured in the previous book. Ling Suyin remains as the only character that appears in all three of my first books as they were originally written (Book #1 precedes Butterfly Swords and its fate is still in the air). What I didn't know is their past and I felt it was so important to who they were now. I see my scenes unfold like a movie and so though I sense the characters' secrets when I imagine the present scenes--because movies always do that, you know? Mysterious looks, close-ups, hidden innuendos--I had to learn who they were to know what it all meant. This is my only book that uses flashbacks which I normally don't favor, but I couldn't see Li Tao sitting down and ever revealing his past to anyone in a conversation, not even to the woman he loves. The same thing for Suyin. It seems like the trend in romance today is that when you love someone, you reveal all your dirty laundry to them. I don't think that's true-to-life and it wasn't true to the culture of background of these characters. There were also a few turns at the end with Suyin's character that I hadn't anticipated and that I had no personal experience with...darn spoilers. Me: Flashbacks are the very devil, aren't they? *g* What are you working on right now? 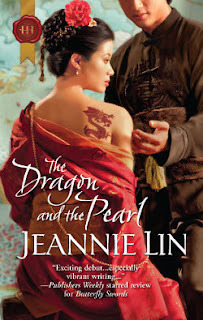 Jeannie: Right now I'm going back to the series with a star-crossed love story about Shen Tai Yang (Ai Li's 3rd brother) and a daughter of the Gao family (Gao is the enemy warlord in The Dragon and the Pearl). It's a Romeo and Juliet tale if Romeo and Juliet had to consider fighting to the death. I've finished several projects that are now in the Harlequin queue that didn't have swords and warlords and focused more on the high culture of the Tang Dynasty, so that's why I'm going back to the melodrama. Me: Thank you so much for stopping by, Jeannie. I love both of her covers too. Just saying. Jeannie Lin is on my list of authors & I can't wait to read more. Definitely work picking up. There's a reason she got the GH. Thank you Joanna for the interview and the lovely comments! Hi, Jeannie and Joanna, fun interview! Yes, I agree, Joanna, I love those covers! Can't wait to read Dragon and the Pearl. @Lynnd - So glad to hear you enjoyed both books. @Diane & Joanna -- I've mentioned before that when I saw the cover for D&P, I felt like Harlequin was doubling-down on me. There are no other covers like it in the Harlequin art library, so I know they really had to invest in both covers. I've been very, very lucky in the cover arena. I am very excited for "The Dragon and The Pearl" and agree that the cover is gorgeous. I loved "Butterfly Swords" so much when I read it as an ebook from the library, that afterwards I bought a copy of it and the "prequel" The Taming of Mei Lin. I wanted both for my personal library. I really appreciate finding a historical romance with an unusual (to the romance market) setting. Congratulations on your award- I think it is much deserved and I look forward to reading your work for many years to come. I have seen you post here before and have thought how nice it is to see writers supporting their fellow authors. Jo, thank you for hosting this interview - I agree that Jeannie Lin does write exciting heroines. Thanks Christine for the lovely comments. I'm glad you enjoyed Butterfly Swords and Mei Lin. I'm actually a Joanna Bourne fan from before I ever published and liked to occasionally lurk here after reading Spymaster's Lady for hints of when Adrian Hawker's story would come out. That's how I knew to jump all over The Black Hawk! Jeannie, my Barnes & Noble didn't have Butterfly Swords when I popped in after reading this interview. Twenty pages into The Dragon and the Pearl, I dashed off to order Butterfly Swords. The covers *are* gorgeous -- among the rare instances when the covers actually evoke the story. 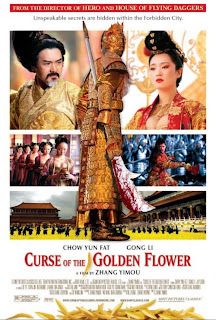 Oh, and Chow Yun Fat? Be still my heart. So happy to hear you're enjoying the stories. Harlequin Historicals are series or category romances (despite the longer lengths) so they're only on the shelf for a month after release. Afterwards the books are available in print from online retailers until supplies run out or digitally. Thank goodness for ebooks! I've been a fan of Chow Yun Fat since forever and am so glad to see him getting international recognition!